Bellamy’s Organic means Bellamy’s Organic Pty Ltd ABN 11 125 461 903, trading as Bellamy’s Organic and its officers, employees and agents. You means the person(s) purchasing Goods from Bellamy’s Organic which these conditions accompany. 2.1 You may place orders for Goods on-line at www.bellamysorganic.com.au. 2.2 Orders are subject to availability of stock and min/max quantities as Bellamy’s Organic decides from time to time. 2.3 Orders placed via Bellamy’s Organic Online Store will be honoured with products with an expiry date of at least four months, unless otherwise stated in the product description. It is recommended that you read the product description for goods placed on promotion, or advertised at a special rate, closely to avoid disappointment. 2.4 By placing the order you are declaring that the goods are for personal use only and will not be made available for resale by you or by someone with your authority. 2.5 It is a violation of the Export Control Act for certain items to leave Australia without appropriate paperwork. Breaches of the Export Control Act may lead to prosecution and imprisonment. 2.6 Bellamy’s Organic reserves the right to request a written declaration (or statutory declaration) that orders are for personal use only. 2.7 It is a violation of the law to place orders under a false name or with a fraudulently obtained credit card. 2.8 Bellamy’s Organic reserves the right to refuse orders whether in whole or in part in its absolute discretion. 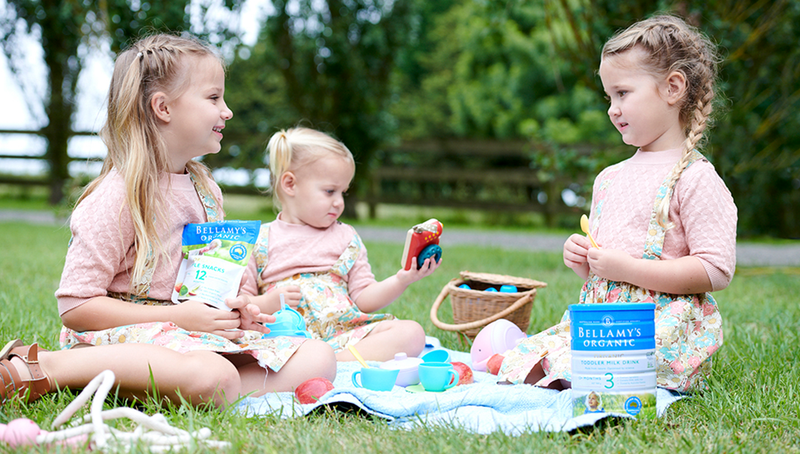 2.9 Bellamy’s Organic will limit the sale of formulas and toddler milk drink to 3 tins, per household, per fortnight (14 days) based on previous order history data. 3.1 You must verify the quantity and quality of the goods upon delivery and if any of the Goods are faulty or not in accordance with your order, you should notify Bellamy’s Organic within 7 days of receipt. Otherwise you will waive any right to reject them. 3.3 Refunds may be held in credit against your account for future purchases if requested. 3.4 You may request a refund cheque or credit for the amount owing at any time by contacting Bellamy’s Organic Online Store. 3.5 If Bellamy’s Organic owe you an amount that is $5.00 or less in total we will hold this amount as a credit owing to you and will deduct it from the total invoice due on your next order. 4.1 Bellamy’s Organic will provide the goods to the Australian or New Zealand address specified in your order, including PO Box addresses. 4.2 Bellamy’s Organic may deliver the goods to other overseas destinations, at our discretion, where prior arrangements have been made with Bellamy’s Organic. Overseas orders may be subject to customs Duties and Taxes, payable by you, the consignee. You will be required to pay all costs in relation to the delivery of the goods to your overseas destination. Damage to property caused upon entering premises to deliver the Goods. Any costs incurred by Bellamy’s Organic due to any failure by you to accept the Goods at the time of delivery must be reimbursed by you to Bellamy’s Organic. 4.4 Any person at the designated delivery address who receives the goods will be presumed to be authorised to receive the goods. 4.5 If you wish to have the goods provided by means other than Bellamy’s Organic usual means, you will need to make all necessary arrangements and pay all costs involved. 4.6 For Australian domestic consignments, invoices for Goods will include a flat rate charge for freight and delivery for packages where the Goods value is less than $58.00. Where the goods value is greater than $58.00 no freight and delivery fee will be charged. 4.7 Bellamy’s Organic reserves the right to invoice you for additional freight and delivery charges where the costs of shipping exceed the amount invoiced to you. 4.8 Domestic orders are shipped via Australia Post’s eParcel delivery system. Australia Post’s eParcel system will only make 1 attempt to deliver the parcel(s). If no one is available to sign for the parcel, a card will be left at the delivery address. The parcel(s) will be taken to a stated Post Office or Mail Centre for collection. Identification and/or signature may be required upon collection. 5.1 Bellamy’s Organic may change the price of the Goods from time to time without notice to you. 5.2 You must pay the price of the Goods current at the time of payment or the time of dispatch of the Goods, whichever is the earlier. 5.3 Invoices are payable before receipt of Goods. Time is of the essence in relation to all payments of money to Bellamy’s Organic under this agreement. 5.4 Where applicable, GST is included in the advertised price of our products and in the calculated postage costs in accordance with the relevant legislation, A New Tax System (Goods and Services Tax) Act 1999. You must pay Bellamy’s Organic any GST payable for the provision of the Goods. 5.5 You are responsible for all duties, taxes and clearance charges that may be levied on the Goods. 6.1 Title in goods passes to you on payment in full for them. 6.2 Risk in Goods passes to you on delivery of the Goods to you, unless you arrange for delivery under clause 4.5, in which case risk passes when the Goods leave Bellamy’s Organic premises. 7.1 To the extent permitted by law, Bellamy’s Organic only liability is as expressly stated in the above terms, and all other guarantees, warranties and conditions are excluded. 7.2 To the extent permitted by law, Bellamy’s Organic liability under these terms and as a result of a consumer guarantee implied under the Australian Consumer Law or any other warranty or condition implied by legislation, is limited to supplying the Goods again or paying the cost of having them supplied again. 7.3 To the extent permitted by law, Bellamy’s Organic will not be liable to you (whether in contract, tort or otherwise) for any consequential, special, incidental or indirect loss or damage including loss of profit. 8.1 You indemnify Bellamy’s Organic and must keep Bellamy’s Organic indemnified against all damages, losses, costs, and expenses suffered by Bellamy’s Organic arising out of any breach by you of this agreement or arising out of your use, possession or sale of the Goods or the use, possession or sale of the Goods by someone with your authority or permission. 9.1 These terms and any invoice referencing these conditions govern the provision of goods and constitute the whole of the agreement between us and supersede any previous dealings, prior representations, statements, and agreements in relation to their subject matter. 9.3 Clerical errors are subject to correction without notice. 9.4 Bellamy’s Organic may sub-contract or otherwise arrange for another person to perform any part of this agreement or to discharge any of Bellamy’s Organic obligations under this agreement. 9.5 You must pay Bellamy’s Organic all costs and expenses incurred by Bellamy’s Organic in connection with these terms including legal expenses, and costs incurred in the recovery of monies owing by you to Bellamy’s Organic or in otherwise enforcing Bellamy’s Organic rights against you under this agreement. 9.6 Neither party is liable for any delay or failure to perform its obligations under this agreement (except an obligation to pay money) if such delay or failure is due to any cause outside of reasonable control. If delay or failure to perform its obligations pursuant to this clause occurs, the performance of that party’s obligations are suspended. If such a suspension exceeds 30 days, either party may immediately terminate the agreement by notice in writing to the other party. 9.7 These terms are governed by and must be construed in accordance with the laws of Tasmania.